I have never been much of a runner for exercise or for any other reason. I think body type has a lot to do with ones inclination to be a runner. Marathoners seem to have a lanky body with small torsos but the sprinters seem to be much heavier. Therefore a certain body type predisposes the running capability of a person. 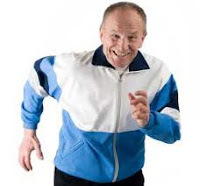 I have had to adapt my exercise to being more of a jogger and walker. Particularly as I have moved into geezerhood. In lieu of tennis or skiing not being available today I decided to travel a significant distance by foot. My goal was to complete a significant loop of distance in my neighborhood that includes several hills. Since running does not work for me I adopted a jog and walk scheme. Telephone poles all along my roads set up a routine of jogging for a telephone pole interval followed by walking the next interval. The good news is that I was able to maintain that pace on the level, climbing a hill and descending a hill. It was a good workout and I didn't have to call my wife as backup to pick me up. I guess the geezer fate is to move from running to jogging to walking. Perhaps the final stage is a shuffle. If I reach that stage someday I hope I still have enough sense of humor to laugh at myself as have laughed at comedian Tim Conway in his character of an inept old man.